XL Video supplied creative video projection and control to the Shangri La area at the 2014 Glastonbury Festival of Contemporary Performing Arts at Pilton in Somerset, UK, helping to give this popular immersive, interactive fictional world a real edge. XL’s Nick Diacre project managed two specialist video installations working for technical producers PF Events and their Technical Production Manager Seain Loughlin, who received their brief from Shangri La’s Creative Director Debs Armstrong. The main projection feature in Shangri La was in the Heaven area, involving eight Barco R22 projectors, run as four doubled up pairs for optimised brightness and mapped to cover a 44 metre long wooden art-wall structure composed from a myriad of hand-cut tessellated triangles. The work was created by Andy Cross from AN-Architecture. This impressive sculpture represented the cloud of Heaven and was brought alive by the projections which added movement and texturing. It featured several entrances allowing people to pass through to explore other areas of Shangri La. As the structure was a freehand piece of imagineering, all the video mapping had to be undertaken ‘on-the-fly’ once it was built. Diacre and the XL team took around 200 photos and from these made a detailed composite of the structure which allowed them to map it using one of XL’s new Mac Pro servers – which was also used to facilitate the entire video playback. The custom map was then applied to the structure during one of the overnight programming sessions during the set up. 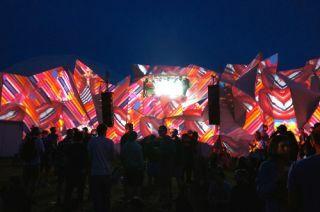 The projectors were installed on four towers lined up with each corner of the wall and cross-projected onto the surface. In addition to this, VJs collaborated with the XL team by supplying audio generative content that was played out through the system, and other artists created a raft of bespoke video material for the project. Diacre was joined on site by XL technicians Richie Jewell, Erica Frost and Media Server & Control Systems Manager Christian Dickens. Related but separate to the Heaven installation, XL also supplied projection, media servers and playback control for “The Pyschotron”, an artwork by Doug Foster comprising an 8 metre circular screen mounted in the roof of a geodesic dome with visual art beamed onto it. The projectors were two more Barco R22s, doubled up driven by redundant Mac Pro servers running Milumin software for both mapping and playback – which allowed the systems to be independently mapped in great detail and played back synchronised for 5 days.